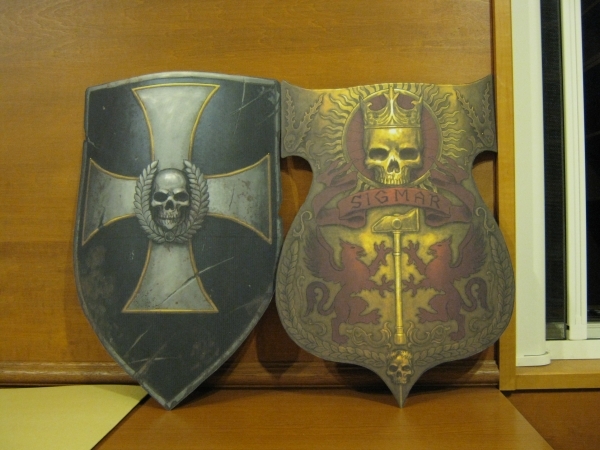 In the second of my holiday travelogs, I'm showing some snaps from Games Workshop's WARHAMMER WORLD in Nottingham, UK. I was lucky enough to have a free day in my schedule, so zoomed up the motorway for a 3 hour drive to Nottingham. 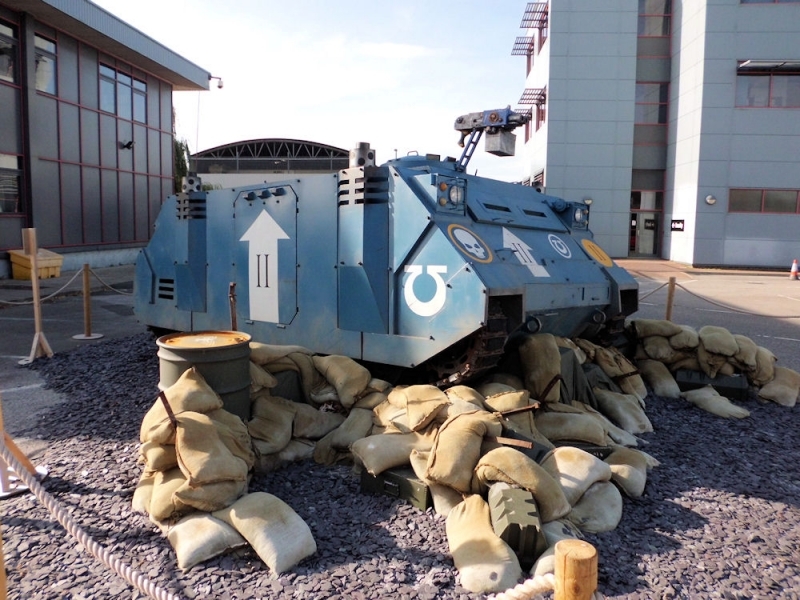 Pulling in to the car park, I found this beast parked just inside the gateway - a full size (and fully functioning, I believe) Rhino APC painted in the livery of the Ultramarines. A very cool start to the day! But I've found a problem - how on earth are you supposed to fit a full unit of Ultramarines inside that?! Here's one of them, kindly posing for my photo, just so you can see how big they really are. He won't even make it through the door frame next to him, never mind play sardines with his other 9 squad members in a tank! 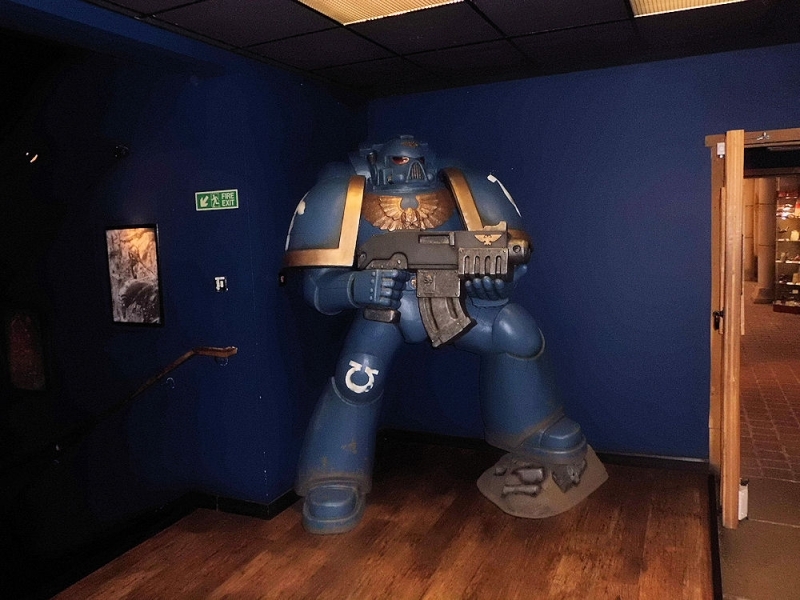 This marine was standing at the top of the stairs inside the entrance, guarding the entrance to the event hall (which you can glimpse on the right). Walking past the Ultramarine statue through the doorway into the event hall took my breath away. I mean, I'd seen it in photos before, but the real thing is SO much cooler! Sadly, the day I was there was a weekday, and there was almost nobody there. So instead of my own photo (which didn't come out so well), I've put in a photo taken from the GW site of the Event Hall in all its glory. That view, by the way, is exactly what you'll see as you walk in - cool, eh? In addition to about 50 (?) 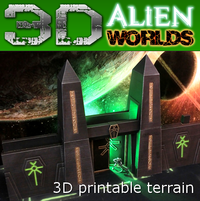 regular sized tables for free play, all Realm of Battle boards, there were about 6 or 7 themed boards, some of which I've posted below. As far as I could tell, those are also free play tables, and I got to watch a little of a game some guys were playing on a Forge World space hulk table. 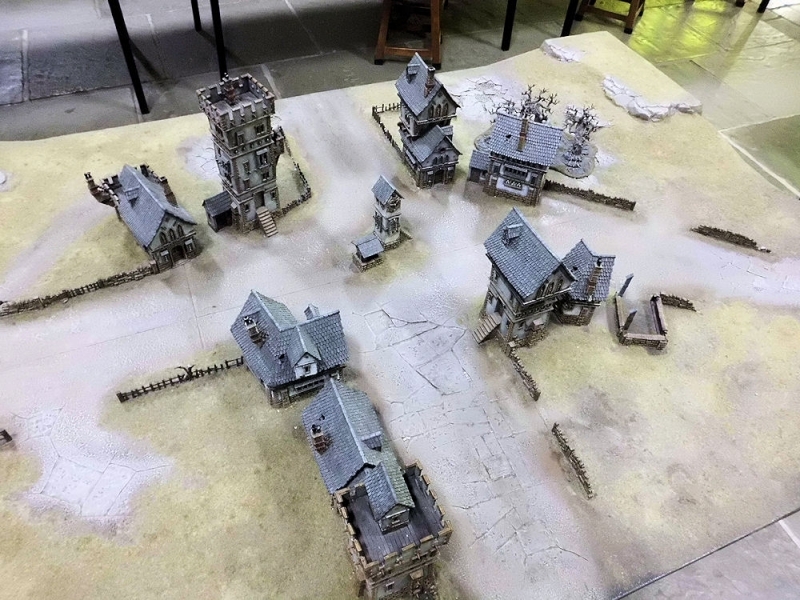 I only wish I could have brought an army and had a game on one of them too! 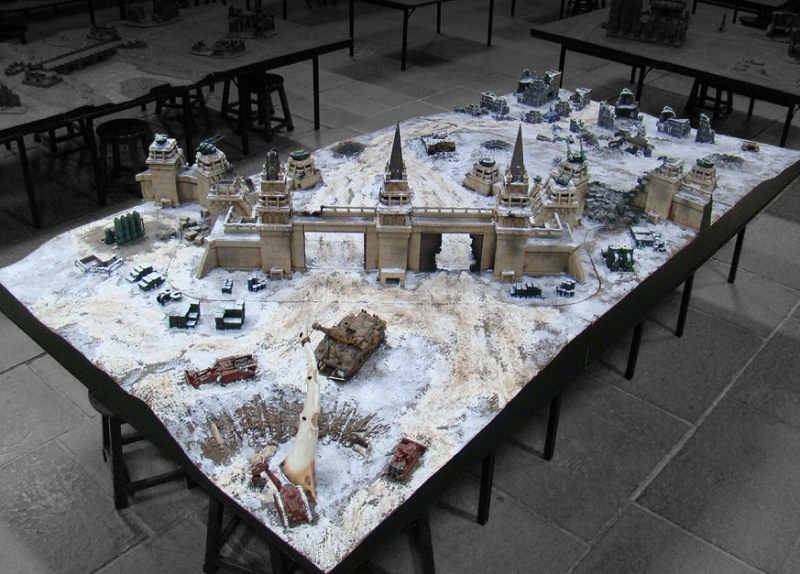 Anyway, this first table was a snow-themed 40K fortress. There are quite a few burnt out tanks strewn around, and even parts of a destroyed titan, and some work engines are in the process of digging out what looks like an Eldar titan's shoulder wing. As I said, wouldn't it have been nice to play on? 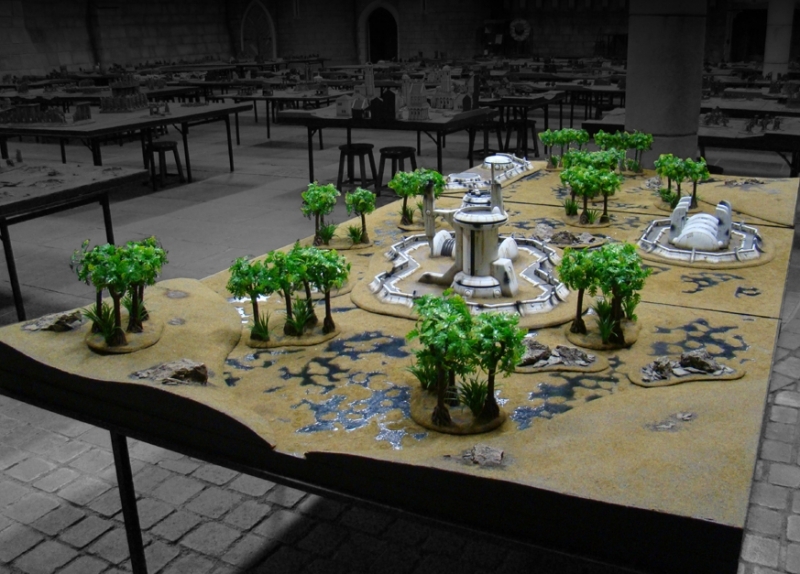 Alongside that was another 40K table, this time a Tau settlement (research base?) in a swamp. 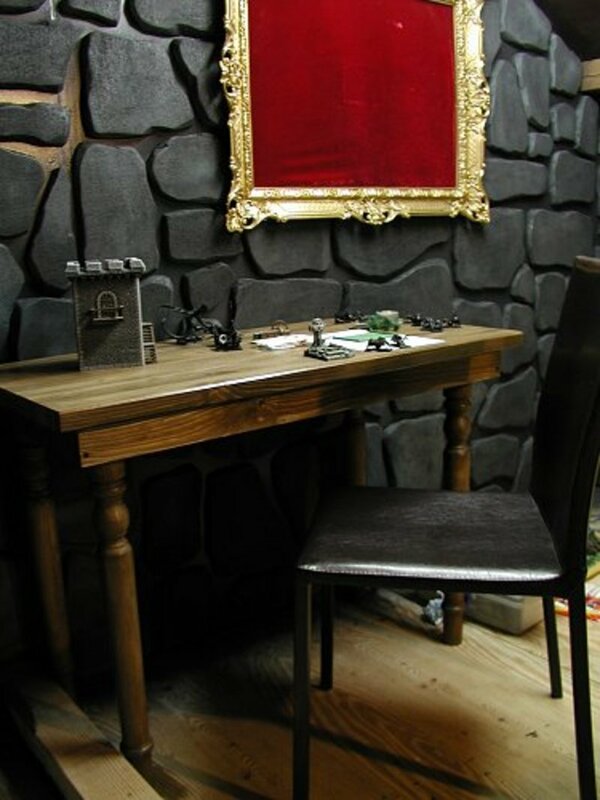 Some really original thinking went into these tables, not to mention some serious effort. A Warhammer hamlet this time, which just struck me as a very realistic layout for a small settlement that has sprung up at the junction of two trade routes. Have you ever wondered what it might be like to walk around inside a gothic cathedral of the 41st millenium? Well, this was pretty convincing, I reckon. This large city board (you can see some of it through the open doors) has a gigantic cathedral at one end, stretching about 2 foot straight up. 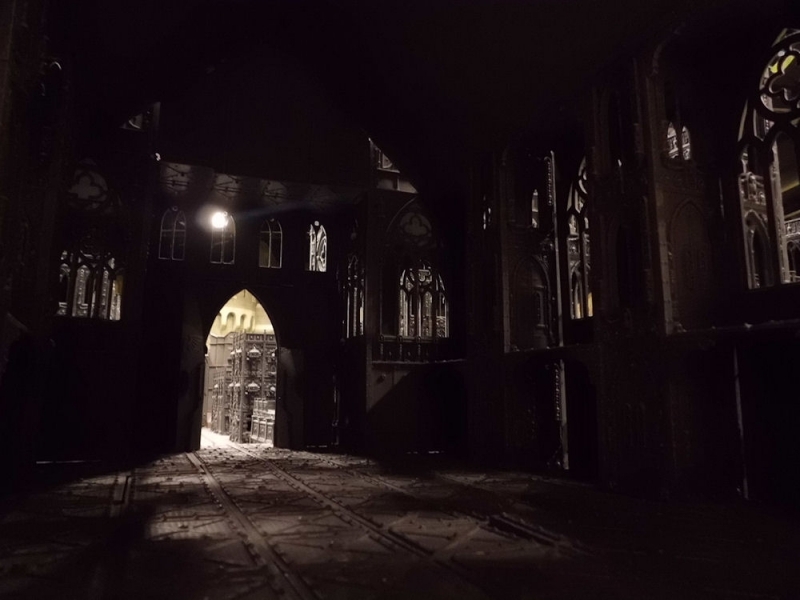 One end of the cathedral was opened up, so you could move models around inside. Very grim and dark. Here's the part I'd really been looking forward to - a Dwarf themed pub at one corner of the event hall. 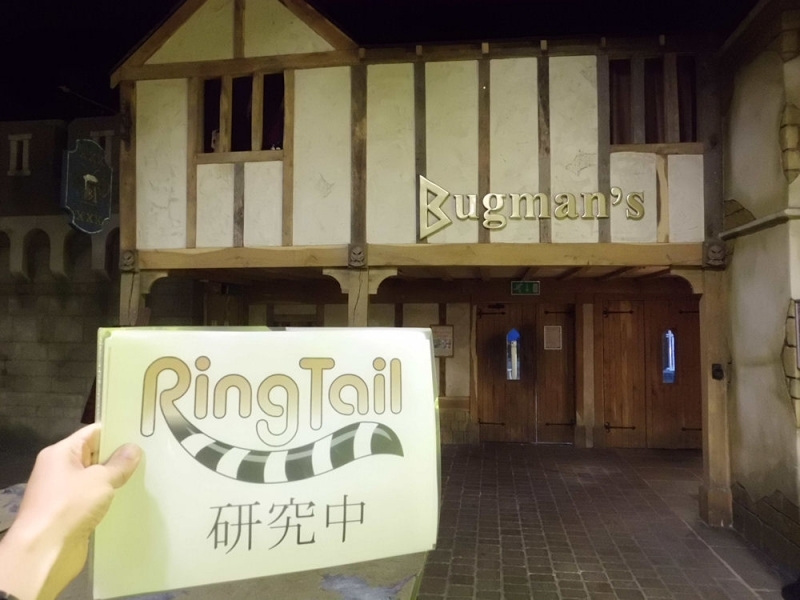 Please excuse the sign for Ringtail - I promised Miyao-san that I'd stick his shop logo in a couple of shots! :) The attention to detail around the event hall is great, and looking closely at everything is very worthwhile - from the sleeping cats and ravens, to the atmospheric "wanted" posters scattered around. So after I'd wandered around Bugman's Bar for a few minutes appreciating the scenery (and the pretty barmaid, naturally! 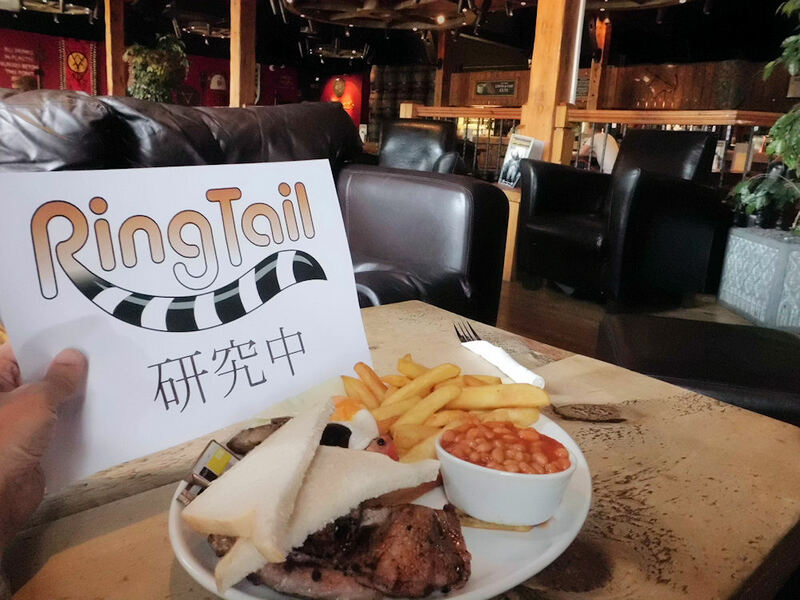 ), I settled down in one corner near the fireplace, and ordered some lunch. Yummy menu, by the way. 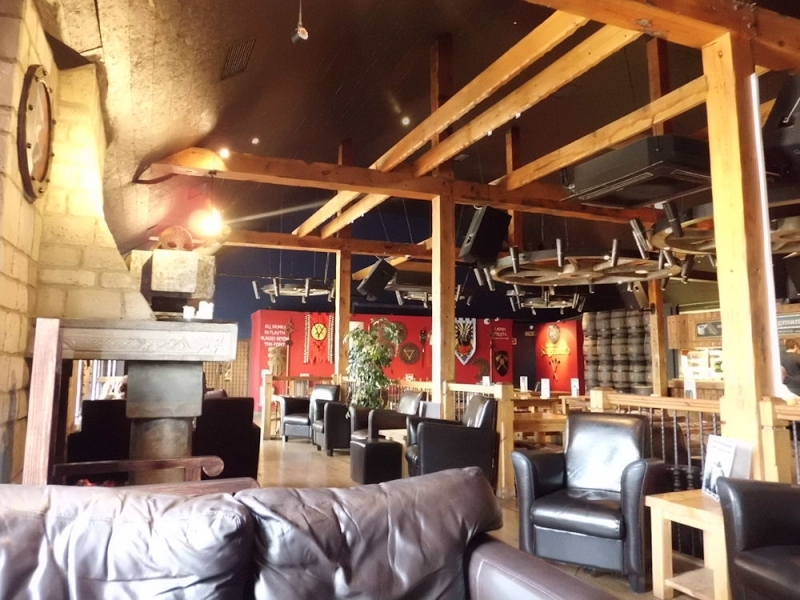 While I was there I saw quite a few of the GW staffers and writers we all know and love, since the offices and design studios also back onto the pub. 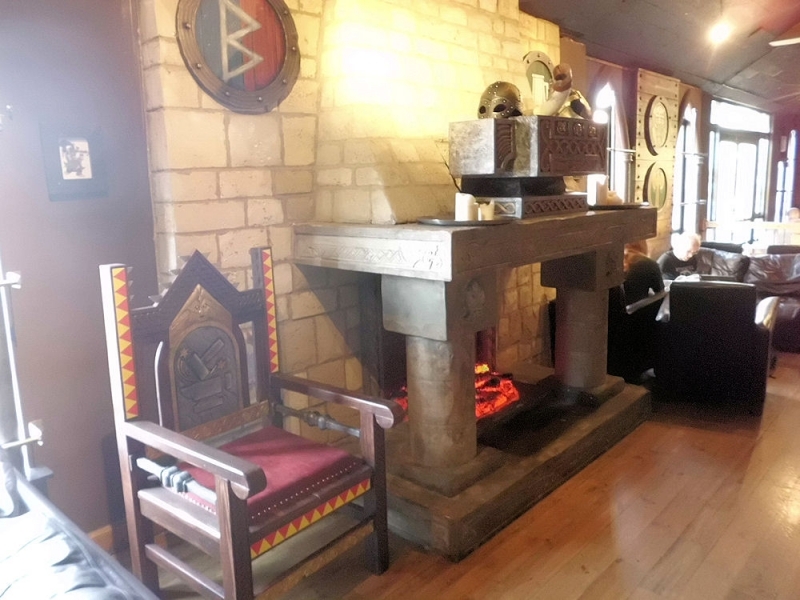 Plenty of dwarfen artefacts to look at, including this chunky stone fireplace, shields, anvil (! ), and a wooden throne. Here's my lunch - a traditional all day breakfast. Yummy! Again, please excuse the Ringtail sign, which reads "On research for Ringtail". Yep, that's some in-depth research. 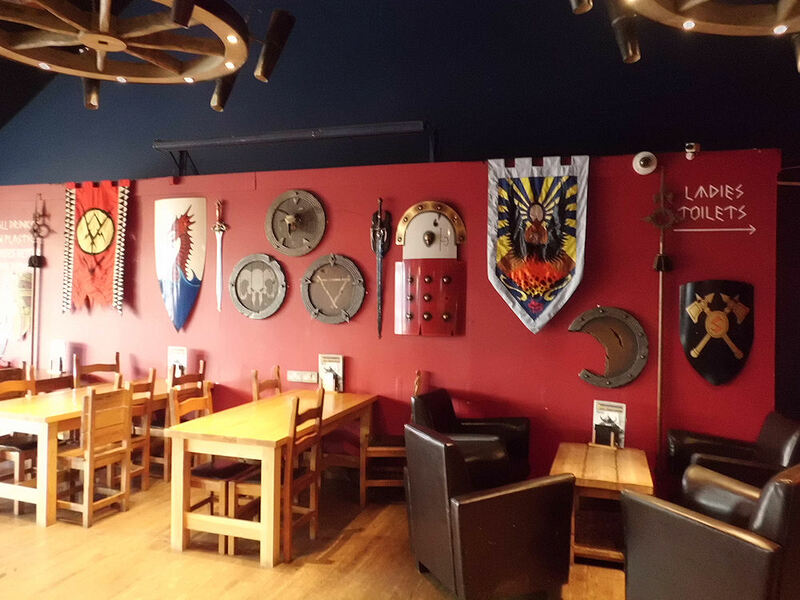 At the far end of the pub is a wall covered in more artefacts from around the Warhammer world. The elven sword and chaos sword (Archaon's, I think?) were particularly cool. 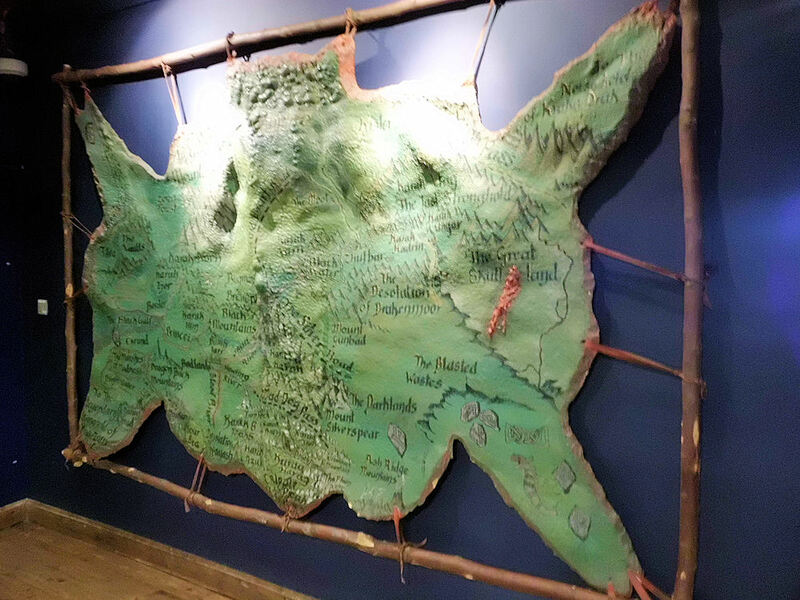 Near the souvenir shop at the other end was this huge stegadon skin map of the Old World. Gruesome, but very fitting. Upstairs from the event hall is this small museum of all the painted miniatures we see in White Dwarf magazine every month. Seeing them in the flesh reminded me just how talented the painters are. It might be quite a small museum (a single room), but even so it took me 90 minutes or so to work my way around, and I could happily have spent more time gazing around. I particularly enjoyed the dozen or so dioramas from ages past - mostly ones by Mike McVey from the 90s. Here are a couple of nice models I found that I had never seem before. 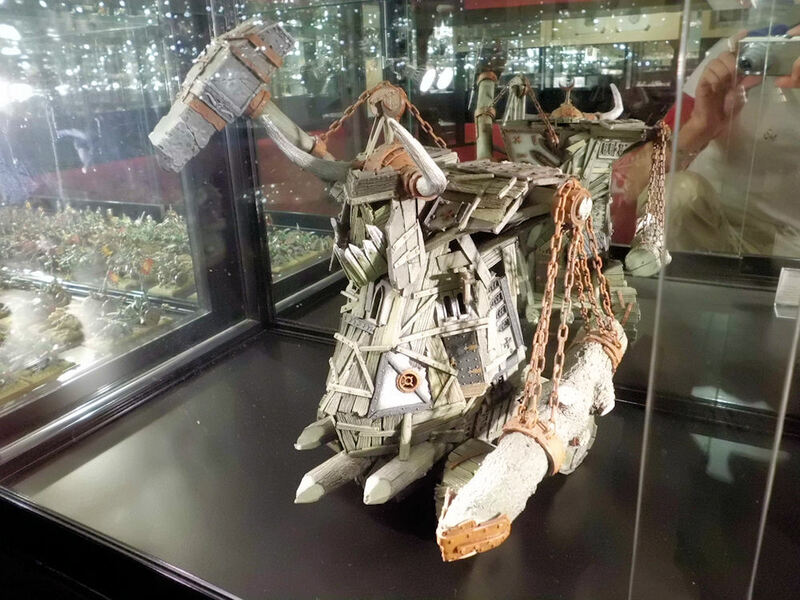 First up is this beautifully constructed Orc siege tower (? 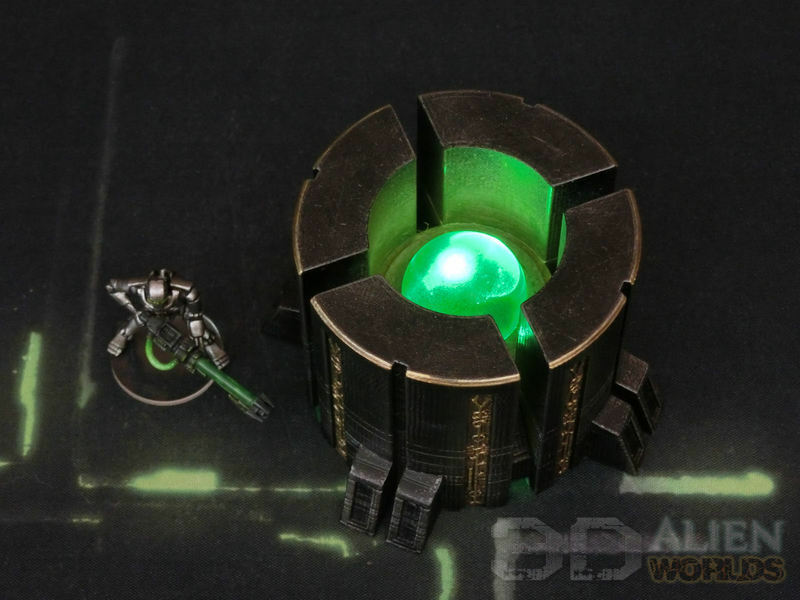 ), which is easily a match for the 40K Stompas in size. Very convincing rust effects. 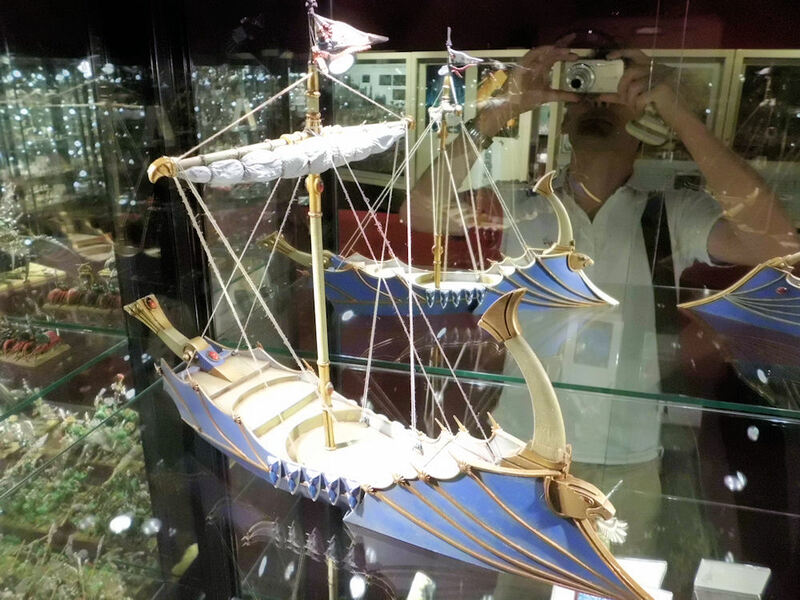 Finally, I took a shot of this high elf dragon ship, because I thought the deck and rigging were especially cool. So that's it - a very cool day out. If you're ever in the area (i.e. the UK), it's well worth a trip!